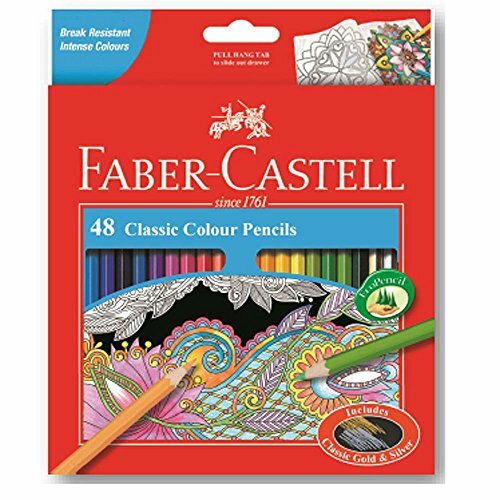 High quality set of 48 Faber-Castell Colour Pencils. Perfect set of pencils for kids and adult coloring books lovers. Set of 48 High Quality Faber-Castell colour pencils. Packaged in a useful slide-out drawer box. The set includes a variety of intense colors, gold and silver pencils. Made from SV-bonded lead to reduce breakage. Sharpen with any standard sharpener. Hexagonal barrel for a better grip and water-based eco paint finish. Non-toxic and safe for children.